Apple on Monday issued its sixth developer betas of iOS 11, tvOS 11, watchOS 4, and macOS High Sierra, paving the way for full launches due this fall. The new iOS 11 beta is listed as build 15A5354b, and should be available as an over-the-air update or else through Apple's developer portal. The latest High Sierra beta, 17A344b, is available in a similar manner on compatible Macs. The new tvOS and watchOS betas are listed as builds 15J5360b and 15R5357b, respectively. Here the update process can potentially be more complex, for instance requiring a nearby iPhone in the case of watchOS. Apple's fifth developer betas were released exactly a week ago. It's not yet clear what changes may have been made, beyond standard bugfixes intended to get the software ready for launch. Public versions of the new betas will likely arrive later this week. Update: Apple has released the public beta versions of iOS 11 and macOS High Sierra for testing. You guys should do a featurette on how the Wi-Fi switch in the iOS control center works now. I find its behavior baffling. Wow, an 3.0 GB build update. I’ve been having more problems with the public betas of iOS 11 than I had with any of the iOS 10 betas. I’m getting freezing, slow typing where the keyboard doesn’t recognize a tap, unless I go it more than once, and only sometimes if I tap hard. Sometimes apps won’t open, or they open and freeze. There are a lot of thing going on here. There isn’t much time left. I really hope this new beta solves a lot of this. It disconnects you from your currently connected network. I'm baffled by your dramatics. Agree... you now have to go into the settings to just turn off wifi ... I reported it as a bug from the beginning but I fear they meant it to work like that... God knows what purpose it serves like that...? I’m hoping for better battery performance. Beta 4 was the best I’ve ever had. Beta 5 was awful. Lots of reboots on my 7 plus especially while using Siri directions in Maps on all betas up to now. I’m hoping that’s fixed too. Seems to crash right when I need the turn by turn the most. I’ve reported these to Apple along with lots of stuff that was killing 3rd party apps. Most of those were corrected in beta 5. Betas are just betas, and intended for app compatibility. Is there any reason to believe this will be a problem in production? 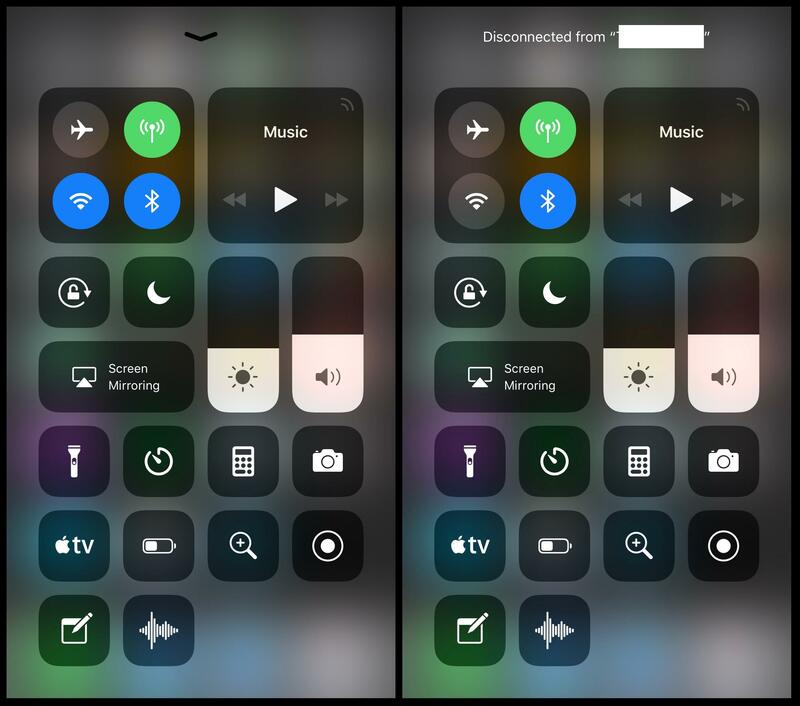 I'm expecting an entire video on all the new and wonderful features in the new Control Center. For me, it might be the best part about iOS 11. I definitely didn't care for the extra page swipe to get to the Music and headphone controls in iOS 10's Control Center. Maybe it's device specific, but I've had great success with my iOS 11 betas. None of the issues you've mentioned. Overall I totally agree. I even like the weird jumble of buttons, which I know grates on the nerves of a lot of designers (hierarchal design and whatnot). But that WiFi switch… alright, so it disconnects me from the wifi, fine, how come I turn on my phone a minute later, it's asking me which wifi network I want to connect to, and the switch has magically turned back on? An on-off button shouldn't be able to turn itself back on. So the button is inactive when you tap it? For me, it's working just as it's always worked. edit: Ah, it turns itself back on. You're right, it shouldn't re-enable itself. I don't think I disable WiFI enough to have noticed that but I'll try to do some tests to see if I have that issue. I do use Airplane Mode periodically, but that's never had that re-enabled. PS: When WiFi Assist came out people made a lot of claims that it's just a scam by Apple to let the carriers get more data charges off of us. I've been monitoring it and WiFi Assist in Cellular only ever shows around 0.03% for all the devices I've checked. It really does help when you're WiFi signal is getting too weak, but I suspect that fallacy will persist like FAS. It's only disabling new connections. Wifi is still on, just disconnected and not able to accept new connections. At least that's what it looks like. Low Power Mode under customize controls. All builds in iOS 11 and Mac HS have been tough to deal with and feel like I spent more time reporting OS bugs than working. The way I look at it, the end user will enjoy their product so much so, that the stock price will increase. I’m testing with a purpose in mind. I certainly hope not. But the fact that iOS 11 betas seem a lot buggier, even now, than iOS 10 betas were, is a concern. remember that Apple often issues a guick update to an OS shortly after it comes out, to kill bugs. It’s not as though the OS is perfect, as that’s impossible. But the more bugs near release, the more bugs that will be in the release, unless Apple somehow can rush fixes at the last minute. Betas are used by developers for compatibility, but that’s just one reason they’re there. The most important reason it to make sure it works. I don’t know what device you’re using. Could you tell us? But mine is having these problems randomly. But when it happens, it can happen for some rime. Closing the machine down and restarting usually helps. iPhone 7 Plus, model A1661. Are you saying that WiFi Assist has "sucked down massive amounts of data," as per the article? Have you checked the data usage in Settings » Cellular, recorded the stated cellular data numbers, converted bytes, and did the math to see what percentage is, as I have?